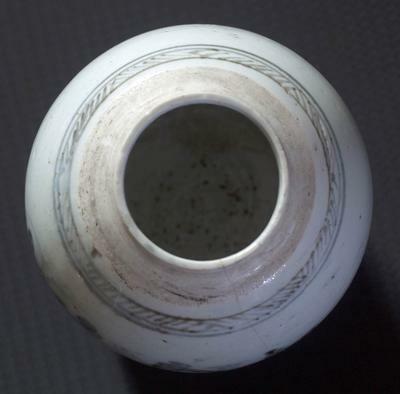 I found this porcelain jar deep under the eves of my family home. The home itself dates to 1720. Came to this website while looking for info on the jar. If anyone is able to share their knowledge and best guess as to date of the jar I would greatly appreciate it. Thank you. There is something intriguing in the scene painted on the jar. If you look closely, behind the hills, it seems that the tall masts of ships have been painted there. Thanks again. 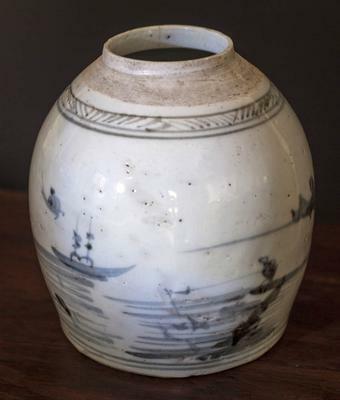 This type of jar was made in the Qing dynasty. The downward shaped shoulder points to later Qing dynasty, but I cannot tell exactly how old or when. Probably 100-200 years. 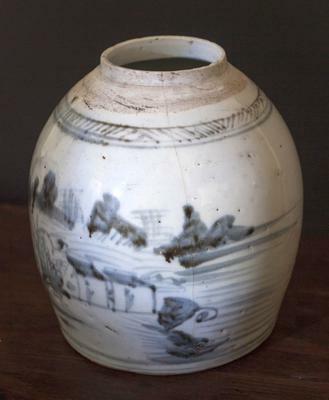 The jar was possibly made in a non-mainstream kiln.